From Seattle's well-known corporate behemoths—Boeing, Microsoft, Amazon, Starbucks, Nordstrom, Costco—to its less-obvious innovators, like Nirvana and Dale Chihuly, a new permanent exhibition funded by Jeff Bezos explores the idea that innovation is a key part of the city's identity. 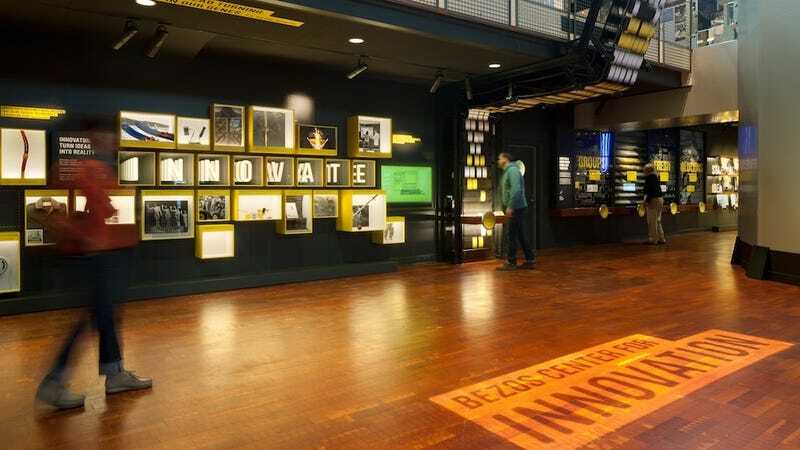 The Bezos Center for Innovation at Seattle's Museum of History and Industry features 5,000 square feet of exhibits which tell a story of science, design, and technology through a sense of place. While so many tech origin stories include the narrative of the solitary inventor slaving away in a garage, that isn't really the case for many of Seattle's major innovations, says Alan Maskin, design lead for Olson Kundig Architects, which designed the exhibition. "In relation to innovations in areas that include tech, we've underscored the role played by groups of people," Maskin explained in an email to Gizmodo, "particularly in relation to large-scaled innovations." So, while innovation as a process has been rooted in Seattle's pioneer spirit of risk, failure, persistence, and luck, true innovation requires working together—which, the Bezos Center suggests, makes Seattle uniquely positioned for success. Throughout the galleries are a series of linked video interviews with twenty local innovators including Bezos—who donated $10 million for the center—speaking about why they choose to live in Seattle and what it is about the region that inspires their work. An interactive timeline weaves through the exhibition shows the progress and interconnectedness of local achievements through the past ten decades. You begin to get the sense that Seattle is not another secretive, silo-heavy Silicon Valley, but rather a network of multidisciplinary personalities working alongside each other who have influenced and built upon each others' work. The exhibition works hard to go beyond Seattle's obvious cultural contributions, showcasing not only airplanes, computers, and coffee, but also philanthropy, the arts, healthcare, and sports. "The design addresses how aspects of the innovation process pervade all disciplines, not just tech, and that it is possible to find inspiration from innovators working outside your discipline as well as within it," Maskin explains. Although the focus of the exhibition is on technology, the designers were careful not to plaster the walls with touchscreens. "The exhibit is designed to address the many different ways that people absorb information," says Maskin. "The pairing of digital interactive experiences alongside the more analog mechanical exhibits is very intentional." When visitors turn a set of gears to scroll through a history of Washington State patent applications, for example, they can see the machine's inner gadgetry and grasp a basic understanding of how it works. Perhaps the most intriguing element is a large graphic novel that tells stories of Seattle inventions, which uses a format that visitors are familiar and transforms it into an oversized immersive experience. The creators hope these ideas will reach beyond museum walls by hosting public events for the tech community and starting new groups like a student Gaming Club, which the creators say is part of the innovation spirit of the city. "One of the things about tech and Seattle is how cross-pollinating it all is," says Maskin. "Seattle has a relatively porous social structure. You run into people at the grocery store, at the Seattle Center and on the trails. That cross-pollination gives Seattle a jump on other regions and helps foster innovation." Bringing that collaborative process to life was a primary goal of the space. In the utmost celebration of the community spirit of innovation, the designers created several different ways to let visitors contribute to and modify the exhibit content itself. Since the center opened in October, an estimated 40,000 people have interacted with the space, says Maskin, where they have been able to take a seat at the "Idea Lab" to design solutions to visitor-generated challenges and contribute their thoughts about controversial topics like the use of drones. "There was a moment in the early concept phases for the Bezos Center when our team realized that the debates we were having around innovations were genuinely interesting," Maskin adds. "We trusted visitors would jump in with their opinions and that dialogue would make for an interesting exhibit." The most interesting additions have been made where visitors were asked to provide suggestions to the list of Northwest innovators. Visitors began writing about teachers, family members, and neighbors who showed qualities of innovation, and the team realized that having that component was an important part of the experience. They designed a flexible exhibit which would allow the content team to to add these additions to the walls of the Bezos Center over time—showcasing the fact that not only is Seattle's innovation very much a community effort, but the best ideas likely have yet to be discovered.